Beautiful scrapbooks to hold those precious photos and memories. The cover is washable and durable with a 3-ring binding. Pages are archival, photo safe, acid, lignin and PVC free. Digital images can be printed or copied to the inserts that are either off white or black to match the box cover. The front of the scrapbook has a place for a 4 in x 4 in photograph. The scrapbook box is finished with decorative top stitching around the outside edges of the box. 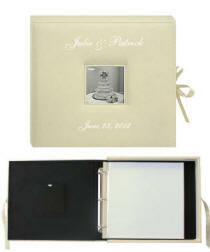 We personalize this scrapbook to create a wonderful family, graduation, engagement, wedding or birthday gift. Personalized with laser foil. The perfect storage for your special memories. This scrapbook album box can personalized with laser foil to create a wonderful graduation, wedding, anniversary, or any special occasion gift. Pages are archival, photo safe, acid, lignin and PVC free. Digital images can be printed or copied to the inserts that are either white or black to match the box cover. The front of the scrapbook has a place for a 4 in x 4 in photograph. The scrapbook box is finished with decorative top stitching around the outside edges of the box, and a satin ribbon to tie it closed. 1" D ring. Ties with a ribbon closure. Personalize with silver or gold foil engraving. This scrapbook holds 20 top loading pages - 10 with heavy paper inserts for photo mounting or scrapbooking and 10 top loading seamless clear polypropylene sheet protectors. The cover is durable with a screw post binding system that allows pages to lie flat. Pages are archival, photo safe, acid, lignin and PVC free. Digital images can be printed or copied to the inserts. The front of this scrapbook has a 5 in x 3.5 in opening for a photograph. 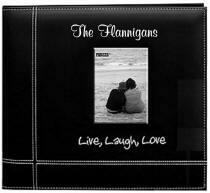 It is finished with decorative top stitching, and the words Live, Laugh, Love embroidered on the cover. We personalize this scrapbook with a Gloss Silver Foil to create a wonderful family, graduation, engagement, wedding or birthday gift. Size 13 1/4 in. x 12 1/4 in. x 1 1/2 in.